VIPAccessEXCLUSIVE: RAWR! 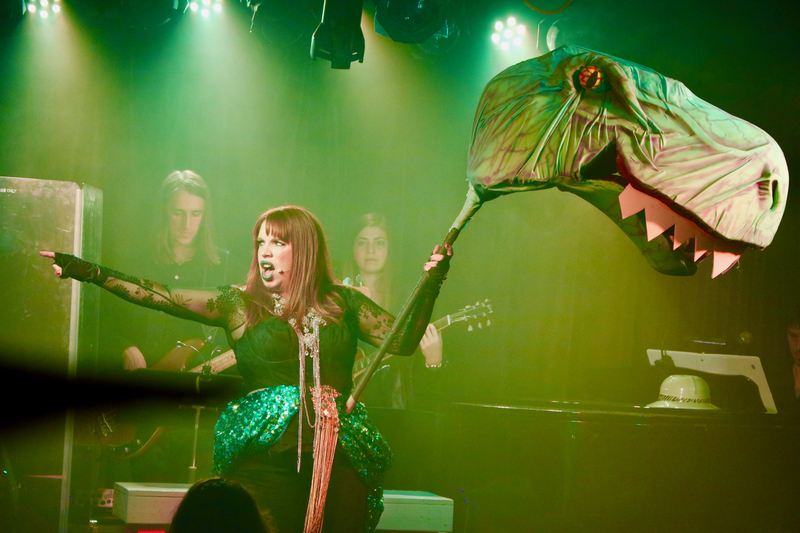 You’re Not Going To Want To Miss Kate Pazakis’ Best Unauthorized Musical Parody Yet – UMPO: “Jurassic Park” At The Rockwell Table & Stage Through 4/28! RAWR! Where can you find a T-Rex, a Triceratops, a Stegosaurus and more roaming about in this day and age? At the Rockwell Table & Stage, of course! From now through April 28th, come and see the greatest show thus far from the “Unauthorized Musical Parody Of…” series – UMPO: “Jurassic Park.” Get ready for a whole lot of thrills, tons of laughs and an endless amount of fun with this spectacular show that is bound to blow you away. Written by the genius herself, the incredible Kate Pazakis has done it again bringing out another masterpiece of a show. Pazakis has written a countless amount of remarkable shows as a part of her “Unauthorized Musical Parody Of…” (UMPO) series including hit shows – UMPO: “Home Alone,” UMPO: “Hocus Pocus,” UMPO: “Mean Gurlz,” UMPO: “Bridesmaids,” and many others. With each and every show, Kate Pazakis has managed to bring the biggest of smiles to her audience and give them an unforgettable night they will cherish forever. UMPO veterans can attest that each of the shows are nothing short of extraordinary, but UMPO: “Jurassic Park” definitely takes the title of the best UMPO show yet! One of the many things that stands out in all UMPO shows are the brilliant song choices. UMPO: “Jurassic Park” features fan-favorite songs including “Livin’ On A Prayer” by the iconic Bon Jovi to “It’s Raining Men” by The Weather Girls, amongst many other terrific songs that will have you ready to get up off of your seat and dance along. Of course, we always love how interactive all of the UMPO shows are. Just beware – a T-Rex might be lurking over your shoulder as you’re eating a delicious flatbread from the Rockwell Table & Stage’s wide variety of scrumptious foods and tasty cocktails and drinks. The cast of UMPO: “Jurassic Park” includes Anna Grace Barlow, Dedrick Bonner, Joe Calarco, Zack Colonna, E.K. Dagenfield, Owain Rhys Davies, Rhett George, Bianca Gisselle, Trevin Goin, Michael Thomas Grant, Keir Kirkegaard, Amanda Kruger, Lesley McKinnell, Lana McKissack, Pablo Rossil, Molly Stilliens, Sterling Sulieman and the one and only, Kate Pazakis. There couldn’t have been a better cast for a show as sensational as this one. It’s clear to see how much time, passion and dedication each of the cast-members put into making this show pure perfection and bringing so much laughs and love to the audience. Watching an UMPO show is more than just an exciting time, it’s an experience that makes memories that will last a lifetime. This show certainly can’t be beat because Kate Pazakis shows that she’s not only a mastermind behind writing all of these excellent UMPO shows, but she even has the most awe-inspiring and breathtakingly beautiful, singing voice. Seriously, is there anything Kate Pazakis can’t do?! One thing that we ask to Kate Pazakis is if she can pretty please star in every UMPO show from now on because she brings the shows to another level with her unrivaled talent. There has never been a musical parody that I’ve laughed at as much as this one! You’re literally going to LOL at all of the hilarious moments. Thought you loved watching Jurassic Park?! Wait until you see the outstanding Unauthorized Musical Parody Of Jurassic Park. I, Alexisjoyvipaccess had the most exceptional time covering the press night of UMPO: “Jurassic Park” and I can honestly say that this is my favorite UMPO show… ever! The cast, crew and creators of the UMPO series never fail to leave me in awe with the stupendous productions they put together. If I could say one thing – it’s to DROP whatever you are doing right now and be sure to get your tickets to watch UMPO: “Jurassic Park.” These tickets will definitely go extinct fast, so buy your tickets now to watch the show as many times as your little dinosaur-loving heart desires. Tickets can be purchased at this link: http://tickets.rockwell-la.com. Previous Article: Chrissy Metz, Hans Zimmer, Darren Criss And More Attended The Renowned 8th Annual Music Guild Awards! Next VIPAccessEXCLUSIVE: Daan Creyghton Talks About Season 2 Of “Hunter Street” In His Interview With Alexisjoyvipaccess! Your amazing article about this UMPO Jurrasic Park is so well written that it wants me to go ASAP to see this show ! I had an amazing time watching this Jurrasic Park Parody. Such incredible ensemble of performers & to top it all the awesome writer herself is one of thecast . The best so far !! !